A step-by-step guide is given below on how to propagate a rubber plant tree from cuttings to easily root and make new rubber plants. Rubber tree (Ficus elastica) plants, also known as Rubber fig, rubber bush, rubber plant, or Indian rubber bush, grow best in warm and bright conditions. They look great with their dark colored glossy ovate leaves and tree like growth habit and are best for growing indoors. I have grown many rubber tree plant from stem cuttings and gifted them to my friends. Propagating a rubber plant needs patience, but not difficult. My indoor rubber tree plant grew very tall, touching the ceiling, so it needed to be pruned (how to prune a rubber plant). I thought to prune it at the top and plant in soil or water to root the cuttings. Is it possible to have new rubber trees like this? If yes, then how to take a cutting from the rubber plant? Earlier, I tried to re-root the cuttings 3-4 times, but failed. However, now I can make new rubber plants by stem cuttings with 100% success rate with the following procedure. Rubber plant propagation is quite easy. Keep reading to learn on propagating a rubber tree so that you can give your friends a free rubber plant. I chopped off the top growing branch and made cuttings out of it to re-root new rubber plants. Spring to summer is the best time to propagate a runner plant when the tree is actively growing. Fill a small pot with a well draining soil. I mix potting mix with river sand in equal quantity to make the soil for propagation. Water well and press the top soil until the water stops coming out from the drainage holes at the bottom of the pot. Push a stick in the soil and take it out to make a planting hole, slightly larger than the stick diameter. Keep the pot aside in shade. The next important step on how to propagate a rubber tree plant from cuttings is to take a good cutting from the tip of a vigorous rubber plant stem. Tip cutting is easy to root. Cut a 6 inches long branch from approximately half inch below a leaf set, having at least two sets of leaves (nodes) of length 4 inch or less. Remove the bottom leaves and cut the other leaves into half. When cut, the rubber plant oozes a milky sap, which is irritating, so wash immediately if it comes in contact with the skin or eyes. Wash off the milky white sap from the cuts with running water. Propagation of rubber tree is similar to the propagation of bougainvillea propagation, blueberries propagation, and many other plants. Dust the leaf less end of the rubber cutting in a rooting hormone or cinnamon powder and insert it in the hole (bottom node in the soil). Put soil around to fill the hole. Do not water. Put the pot in a clear polythene bag and tie the top of the bag so that the cutting remains in high humidity environment. Place the pot in a warm place in indirect light. In 3-4 weeks, the rubber tree cutting will develop roots. Gently tug on the base of the stem and feel for resistance, which indicates that some roots have formed. You may see the roots coming out from the hole at the bottom of the pot. At this stage remove the covering, but still keep the pot in shade. Water lightly. Wait for the new leaf to grow fully. Shift the pot in a place which receives morning sun. Keep there for 4-5 weeks, keep the soil damp. Then transplant the plant into a bigger pot. You can start 3-4 rubber plant cuttings in the same pot and later on separate each one with care when new shoots emerge. I rooted more than 4 cuttings in the same pot. Air layering is another method to propagate a rubber tree plant. In this method of rooting, you do not cut the stem but leave the cutting on the tree while it is rooting. 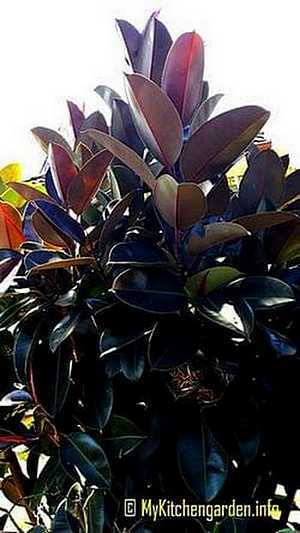 The first step in propagating a rubber tree with air layering is to choose a stem, at least 12 inches long. Choose a healthy portion of the stem where you wish to root the stem and remove any leaves immediately above and below the portion. Carefully remove 1 inch wide strip of bark around the stem using a sharp knife. Scrap all the soft part in the ring, leaving the hard wood intact in the center. Dust the ring with rooting hormone and cover it with moistened sphagnum moss. Cover the sphagnum moss fully with a polythene covering. New roots will grow in 3-4 weeks time in the covered ring of the stem of the rubber tree. Cut the rooted stem from the mother plant and repot the new plant. Variation: Make a cut about halfway through the stem and insert a toothpick to keep it open. Dust some rooting hormone in the cut and cover it with moistened sphagnum moss and wrap in a polythene cover. How To Transplant a Rubber Tree Plant? if your rubber plant is growing in a pot for a few years, its root will start to emerge from the bottom holes. At this stage, you should transplant it into a new pot.Take out the plant carefully and transplant it into the new pot of the next size (1 inch larger diameter only). Use new potting soil to fill the plant.